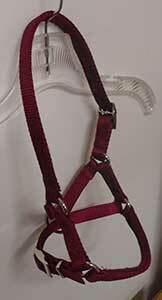 Have bought these halters and love them! They are very adjustable to fit any pretty alpaca face size or shape. Soft fleece lining more comfy on the nose when halter training your alpaca. Highly recommend, and they come in such nice colors. These halters are the best! Comfort fit with extra padding for the delicate nose of alpacas. Very adjustable, will fit any shape or size.